The map below illustrates the migration paths of the first Golden Eagles to return (Sequatchie and Cherokee). Sequatchie spent the reeding season west of the Hudson Bay in Manitoba, Canada. Cherokee spent the breeding season west of the Labrador Sea in Newfoundland and Labrador, Canada. TWRA lead research on Golden Eagles wintering in Tennessee is part of a large project across the Appalachian Mountains coordinated by Dr. Todd Katzner at West Virginia University and the Eastern Golden Eagle Working Group, presenting information on the project at AppalachianEagles.org. Research is designed to document occurrences of Eastern Golden Eagles on the wintering grounds, which will allow for a greater understanding of population size and habitat use. Through tracking birds with transmitters, we are hoping to better understand specific habitat uses, spatial movements, migration corridors, esp. in areas where there is potential for wind development, effects of spent lead ammunition, leg hold traps, and fragmentation of forests on Eastern Golden Eagles. Ultimately we will gain more information about the origin of Eastern Golden Eagles wintering in Tennessee and the southeast as the birds collect data year round and will provide detailed information on breeding locations. In January 2014, TWRA staff, Daniel Moss at Ft. Campbell, USFWS, and TNC personnel operated at least 19 bait sites across Tennessee from the Haywood County and the Hatchie River to the TN-NC state line. Golden Eagles were only recorded on 5 sites, which is an unusually low percentage of sites with birds as compared to previous years success rates. We began trapping efforts the last week of January 2014 and continued through mid-Feb. Trapping success was low (lots of unusual technical issues and nervous birds), but Mike and Trish also trapped in Alabama for a week and caught three birds south of the border! As of 21 February 2014, they traped 3 birds in Alabama which are flying around with transmitters purchased by partners in Alabama, 2 birds caught at the Hytop site in Alabama that have (or will get) a TN purchased transmitter, while a 3rd bird was caught at Unaka Mountain just into North Carolina (he has a TN transmitter as well). 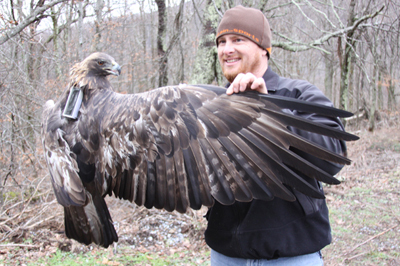 In January 2012, TWRA and TNC managed 15 different bait sites for Golden Eagles and documented Golden Eagles at 6 different locations in eastern Tennessee. 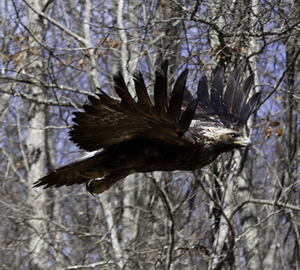 In January-February 2013, TWRA, USFWS, and TNC operated 10 bait sites and documented Golden Eagles at 5 sites. We also trapped 3 Golden Eagles and attached GPS transmitters that send data to cellular communication towers. Transmitters are developed, deployed, and data is managed by Cellular Tracking Technologies. TWRA - Josh Campbell, Terry Hopkins, Chris Simpson, Dustin Thames, Chris Ogle, Scott Dykes, Sterling Daniels, Rob Colvin, Jeremy Dennison, Keith Thomas, Tommy Edwards, and Mark Vance in addition to other WMA managers and technicians. Mary Miller with USFS and Ken McDonald with USFWS. Eric Soehren with Alabama DCNR coordinated with Frank Allen at a site in north Alabama. Chris Kelly with NC Wildlife Commission coordinated sites in western NC. Daniel Moss at Ft. Campbell. Trish Miller and Michael Lanzone in coordination with Scott Somershoe (TWRA) worked with field personnel to trap birds. Todd Katzner with West Virginia University (now USGS in Boise) was and still is the brain child behind the entire Golden Eagle research project.